12 years ago I bought the Lonely Planet guide to Iceland, Greenland & the Faroe Islands. Finally, last Friday, myself and the BFF flew to Reykjavik for a four night stay. It’s very popular these days to book a ‘package holiday’ with Icelandic Air or through Groupon, Expedia or Secret Escapes. Immediate thoughts are ‘Iceland is soooo expensive’. I found a deal which was four nights staying at the Fosshotel Baron, bus to the Blue Lagoon, entrance to the Blue Lagoon and upgrade to the Comfort Package (free hire of towel, bathrobe, free drink (for us sparkling strawberry wine) and a free algae mask or volcanic rock scrub), a boat tour hunting for the Northern Lights, and I added on bus transfers to and from airport and an 8 hour day trip round the Golden Circle. All in all for just under £500. Bargain! I also researched how much it would be to book it all independently – fly with WOWair, book into a hostel (some are rather swish looking) and book the day trips seperately – pretty much came in at the same price. So now just food and drinks to pay for…… the rumour was to expect to pay £10 for a pint. It was good to be prepared for such costs, especially as it was the BFF’s birthday and a few drinks would be on the cards. It was a wonderful surprise to find out it isn’t as expensive as everyone thinks, or maybe I have lived in London for too long! At time of writing, you cannot easily buy Icelandic Krona in the UK as the Icelandic Government has limited the supply of krona. As we booked our trip as a package everything was paid for except for food and drinks. ATM’s are widely available (one at the airport too), cards are accepted absolutely everywhere and hotels and banks exchange currency for a fee. Quite a few of the places we went to also accepted Euros. 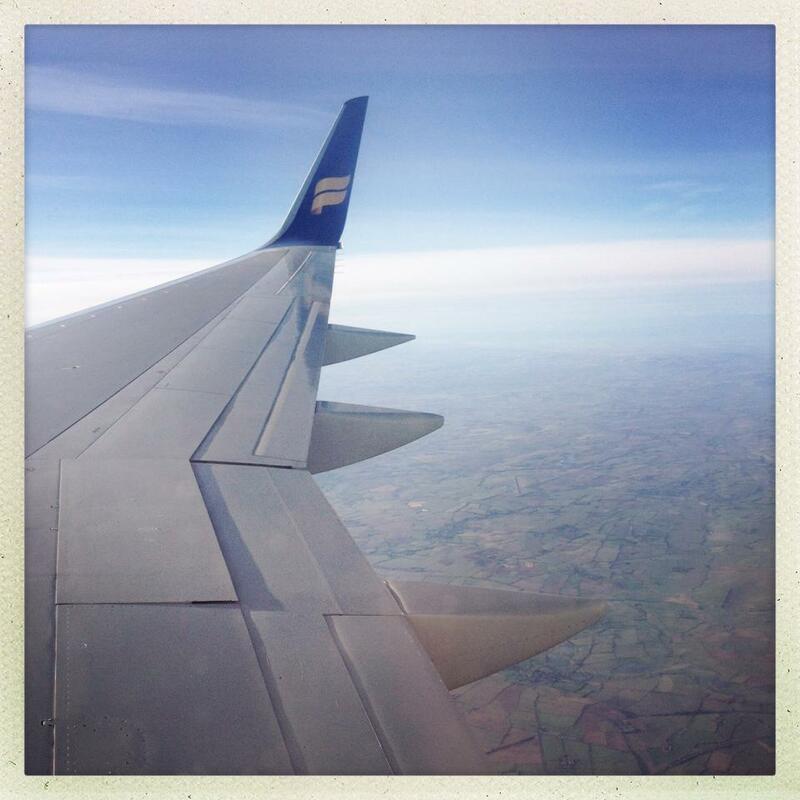 Heathrow – Reykjavik: three hour flight. No time difference. Obviously what happens when you book on these packages is the cheap advertised price is for the awkward flight times and the lowest graded hotel they offer. We took the awkward flight times but upgraded the hotel to a mid range. To be honest they weren’t that awkward. Our UK budget airlines do worse times! Included in the price is hold luggage up to 23kg, free drinks soft drinks on board and an entertainment system with a great selection of new and old movies, tv programmes and music. Beats flying UK budget airlines and dealing with all of those “add ons”. However, Icelandair is the first non budget airline I’ve flown with that doesn’t include a free meal or snack. You can buy on board but we just did our usual stop at Pret and grabbed some sandwiches and water to see us through the flight. We arrived in Reykjavik at 11.35pm. The airport was very quiet. No queue at passport control and the lovely lady who checked the BFF’s passport wished her a “Happy Birthday for 10 minutes time”. How lovely! Bags came out pretty much straight away, always a relief as I’m so used to carry on luggage. As I had prebooked us a Flybus Plus ticket we didn’t have to queue for tickets. Straight onto the bus. The Flybus meets every flight and their service is very effecient. As everyone is staying at different hotels the large coach takes you to the Bus Terminal and then providing you bought the “Plus” ticket they will then transport you to your hotel on a smaller bus with just a few stop offs. There’s free wifi on the bus. Bonus! The drive is only about 40 minutes and takes you through the black lava fields but as it was past midnight it was so dark there was nothing to see. There had just been a fresh fall of snow too so the roads were very snowy and icy but all of the vehicles were fitted with winter tyres. This is the first time I’ve witnessed snow not being an issue! Everything would have ground to a stop in the UK with just the tinest snowflake falling. The night before you leave, you just ask your hotel reception to book your return journey to the airport. Timetables are available and pick up is half hour before those times. The Baron hotel is very centrally located. About 50 yrds to the water, 50 yrds to the main shopping street. There are superior rooms at the hotel you can upgrade too – ones with a view of the snowy mountains and water, and some vintage style. We just stuck to our basic twin room. It almost felt like a Travelodge type room except for the single beds! The bathroom is tiny with the smallest shower cubicle, but still serviceable. The rooms are clean and the reception staff are very helpful. Two main points – breakfast is included: always a bonus when you’re travelling to an expensive country! Secondly, happy hour, haha. A pint of local lager ‘Gull’ cost us approx £2.75 a pint. I don’t know anywhere in London you can get a pint that cheap! There isn’t a restaurant to buy lunch or dinner but they do offer a packed lunch and soup with bread in the evenings at reasonable prices and there are plenty of restuarants and cafes to choose from that are within walking distance. Hot water, like through the shower, comes directly from the hot springs. Smells of sulphur. On first experience the BFF may have possibly blamed the smell on me *shame*. Cold water, comes straight from the springs too and is perfectly a-ok to drink. We still experienced the smell of sulphur coming from the cold water tap on occasion though. It’s all renewable energy sources. The hot water from the springs powers most of the electricity across the country. I’m not sure I could ever get use to the smell but great for the environment! It’s a bizarre experience. In January, the sun rises around 11am and sets about 4pm. We arrived in the dark, we got up in the dark and the sun was just rising above the mountains as we were on our way to the Blue Lagoon. It constantly feels like you’re getting up at silly o’clock to then realise it’s nearly lunch time! Our first day at the Blue Lagoon was perfect. Clear blue skies, beautiful sun and only a mere 4c! The following two days the weather turned for the worse and whilst the sun was “up”, there was complete cloud cover so it always felt a little like it was dusk all the time and don’t even get me started on the wind! That story will soon come. In the summer the sun barely sets. Hope I get to experience that too at somepoint in the not so distant future! Not required or rather not essential! Yep, no added 12.5% service charge added on to bills, no trying to find loose change or small notes. It’s a strange feeling. Notes on the Blue Lagoon, Reykjavik, The Golden Circle, food & drink to follow…. ← Jordan – Dead Sea, Bethany Beyond The Jordan. Final Day.